How Do I Get Free Trailer Plans? OK, You’re Asking . . . So We’ll Deliver! I agree, free trailer plans does sound pretty good. And, for that matter, how about Free Gantry Crane Plans, or Free Press Plans, or Free Any-Of-The-Plans-We-Have! OK, we can do that, so let’s make a deal. You help us and We’ll help you. For truly free trailer plans, there are sites that give plans free, but you get what you pay for. Trust us, we’ve looked. Personally, if I am spending time and money on a project, then it’s going to be worth having. Our plans are different. Plans from Mechanical Elements are Fully Engineered Do-It-Yourself Plans from Synthesis, a Colorado based Engineering & Design Services company. The plans we offer here are way better, by design. They include the blueprints themselves, plus a package of instructions with lots of hints and explanations. This is the complete package for awesome products and lots of options for customizing. You don’t get all that in free plans from other websites. There is a lot of work that goes into these plans. Many hours of design work and analysis to make sure they are the best for you, our customer. We spend a lot of time writing notes on the drawings, specifying the Bill of Materials, and in writing and illustrating the instructions. The cost of custom plans is $1ooo to $3000 or more, so prices on our site are a true bargain. So, you want free trailer plans? OK, plans for free — as in without financial cost. How? It’s simple, You help us and We’ll help you. We’ll trade backlinks for Plans. This website is all about supporting you. Over the years you’ve asked a bunch of great questions which we try to answer in emails, comments, and articles. Try this collection of illustrated articles — ready for you to learn from and enjoy. Our blueprints are relatively inexpensive in the Plans Phop. We have Gantry Cranes, Hydraulic Presses, Utility Trailers, Tiny House Trailers, Storage Solutions and more. 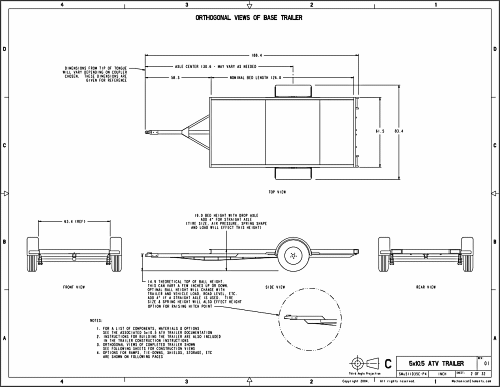 We have requests several times for ‘Plans for Free’, and in particular ‘Free Trailer Plans’. That’s cool, but it works best when we both have a little skin in the game. I’ll give you free plans in exchange for a little help. One of Google’s ranking factors is something they call backlinks. Basically, Google wants to see that other sites link to Mechanical Elements as a way of judging whether we provide good reasons for people to visit. Our business is a little different than many on the web because most people only want to build one trailer for example. They search us out, buy the trailer plans, then go build it. Many customers come back for building tips, but they don’t typically return to buy plans again until after they build the first project. Also, most people that build an awesome trailer don’t have much need to build another one right away. We think that’s great, because it means they’re satisfied. Unfortunately, that does not satisfy Google. It doesn’t quite fit their robot paradigm. They seem to think if people don’t buy more often, then perhaps they don’t really like the website. Those of us that build are sort of outliers. That said, the way you can help us is to post a link to us from your website. If you have a website or a blog that deals with DIY stuff, or building stuff, or maker type topics, or trailers, or tools, or anything like that, then I’m willing to trade a link and a good word for a set of plans. You choose what page on MechanicalElements.com you want to link to, then you choose what you want to say. Post it, then send us a note and let us know what set of plans you want. Free Plans, like Free Trailer Plans! That’s pretty easy. Just so it’s clear, trading links for plans is a form of paid advertising in barter rather than money. Please only say things with the link that are true, and what you believe. Also, you should mention somewhere that you are compensated for the link. We believe it’s important to be open, honest and transparent. Once we approve the new link, we’ll send you a coupon code. Then, you can select the free plans you want. We love the shared back scratching! And, if that helps you get into your project, then it’s all good. Backlinks for us are important too. This offer is good for a limited time, so act soon. Get Free Trailer Plans or Free any of the plans we offer. Just remember, it’s not technically and totally “FREE”, because it’s helping each other. Thanks for visiting, and good luck posting the links.